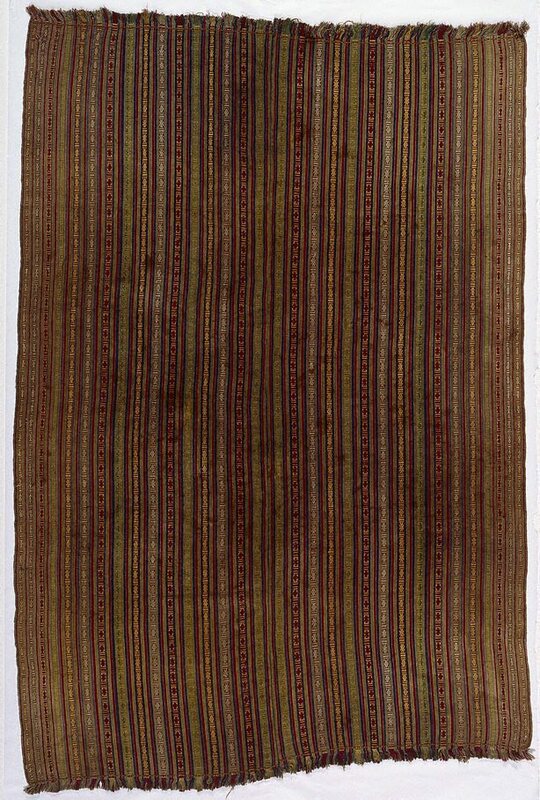 This Bhutanese textile or 'kira' is worn as a type of shawl, held at the shoulders by a silver clip. Although apparently simple in its striped design, the ‘kira’ is categorised according to a complex system based on the varying number of stripes patterning the cloth and their colour schemes. 'Kira' fall into three broad categories: the first category referring to plain coloured striped cloths, often with double-faced or continuous supplementary warp weave embellishment, such as this textile, are for everyday use. The second category refers to either blue or green cloths with intricate embroidered embellishment; and the third category consists of the intricately woven silk or silk embellished cloths used by the Bhutanese aristocracy.